In any business that has a warehouse, a major key to profitability is making sure the warehouse runs as efficiently and as safely as possible. This means keeping it organized, free from accidents, up to code, and easy to navigate, for the warehouse staff or visitors. 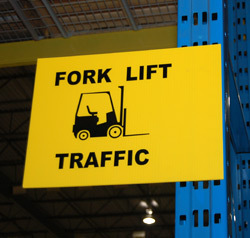 A valuable tool for keeping your warehouse running safely and smoothly is signage. There are many ways signs can be deployed to keep things safe, to keep things organized, and even to keep staff and visitors on track. This post reviews some of the types of warehouse signage that could help in your warehouse. Safety Equipment Reminders—In warehouses that make use of heavy machinery such as power dollies and forklifts, it is important to remind employees to wear the required/recommended personal protective equipment. Label Hazardous Zones—In areas that are prone to danger, such as next to power generators or areas that are heavily trafficked areas for machinery, specific signs are required to remind people of the potential hazards. Training and Safety Reminder Signs—Heavy lifting or failure to follow protocol can lead to injury. 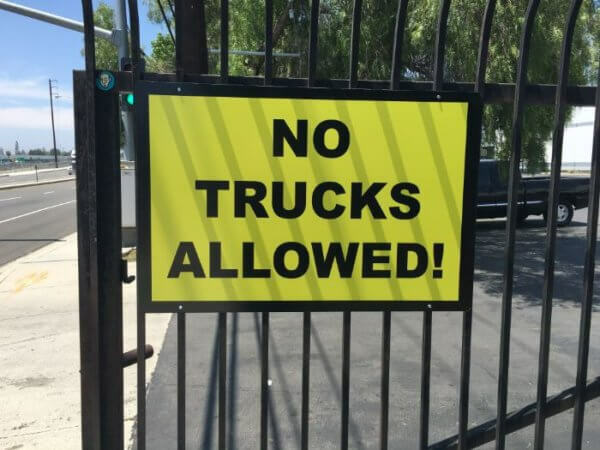 Signage that reminds your employees about best practices for lifting and moving heavy items, as well as signs that remind employees of the training and safety requirements for operating certain specialized equipment can help keep your warehouse safe and productive. Emergency Signage—Emergency signage includes clearly labeled fire extinguishers, first aid kits, eye wash stations, equipment shut-offs, and most importantly, emergency exit signs. Using graphics to label shipping bays, garage doors and more—Often times, drivers from outside of your company may be picking up of dropping off shipments at your warehouse. You can make it easy for these people by clearly labeling where they should go to. This can save time and help avoid confusion and frustration. Creating “lanes” and “permissions” right on the floor—Forklift drivers and pedestrians alike are often navigating the corridors of your warehouse, and sometimes posting signs about foot traffic and forklift traffic might not be enough. You can put graphics right on the floor, color coding areas where walking is permitted and prohibited, and even create lane lines to make sure forklifts can safely pass one another when heading opposite directions. Indoor “Traffic Signs”—Traffic signs aren’t just useful on the road. 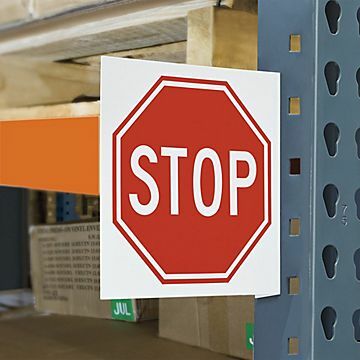 Stop signs, yield signs, do not enter signs, one-way signs, pedestrian crossing signs are just a few of the potentially useful signs that you can appropriate from the roads and bring into your warehouse to make it safer for drivers and pedestrians alike. Blade Signs for the Ends of Aisles—Blade signs are the industry name for signs that stick out from walls or shelf ends so that they can be seen from far away and without turning your head. Especially in larger warehouses (but really in any size warehouse), being able to plot a course to the appropriate aisle by easily glancing and seeing your destination can speed the process along. Individual Labels for Shelves—Whether you simply need numbering or if you need to be able to interchange labels of exactly what items are located on what shelf, professional signage solutions can make a potential headache into a really easy and convenient job. 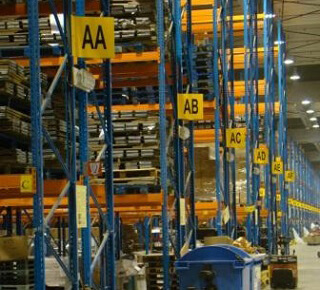 After all, quickly locating the correct items is the key to warehouse efficiency. Whether you know exactly what your signage and graphic needs are, or you are just getting started and looking for advice, the trusted experts at Starfish Signs and Graphics are here for you. We help you both in finding the signage needed to be up to code and with finding the signs that meet the visual requirements of your brand. And in fact, the Starfish Team is uniquely experienced in all types of Warehouse Six Sigma, Lean Manufacturing, TPM and safety signage. Contact one of our designers today to get started.